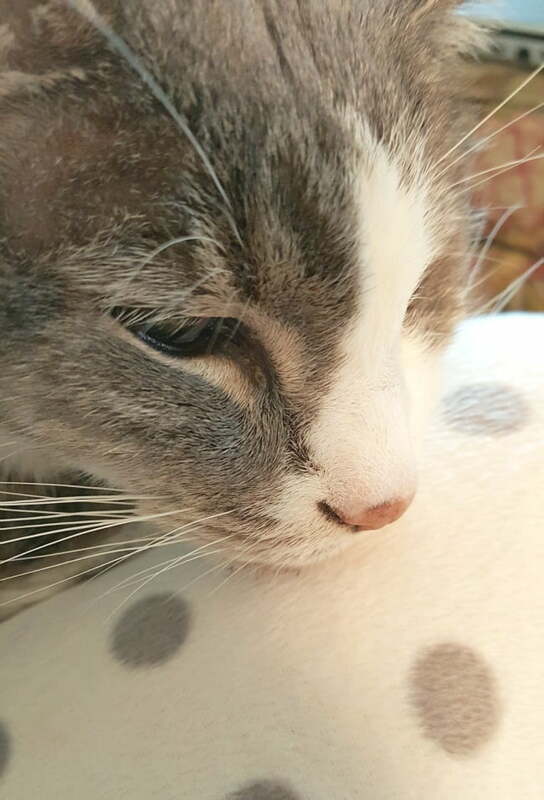 It was exactly 2 weeks ago today that we had to put our cat Rascal down, and this memorial post is the hardest post I’ve ever had to write. I debated whether to post about this or not, but then I felt like many of you dear readers who have been following us for a long time would wonder what had happened to him. So I’m sharing how difficult the past two weeks have been. And any of you pet owners who have experienced this can definitely relate to my devastation. There have been things that I could have been cleaning and organizing, phone calls I should have made, projects I needed to begin, etc. but I just have not felt like doing any of those things. Even I have been surprised by my depth of sadness. But now that some time has passed, I’m able to tell you about losing one of our fur babies. Rascal came to live with us almost 17 years ago when we rescued him out from the animal shelter in Columbia, SC. We had moved into a new home the year before and I had been begging Leo for a pet. Our friend Trish, who had several cats, urged us to get a cat. But Leo always had signs of being allergic to cats whenever we visited her home. But one weekend when we were visiting Trish and her husband, Leo relented and we all hopped in the car and drove to the shelter before he could change his mind! 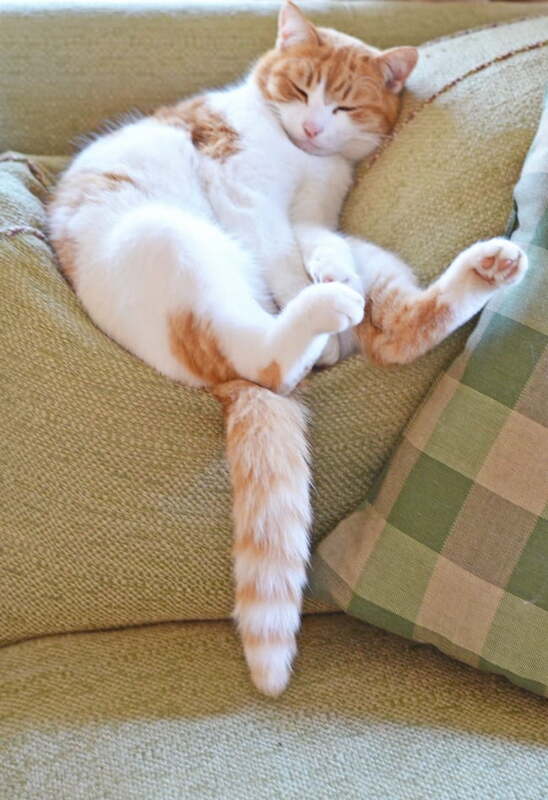 It didn’t take long to choose Rascal because, as you can see in the photo above, he was so darn cute! We made a quick stop at a pet store to buy supplies that we would need, and then Leo and I got in the car and drove back to our home in Mt. Pleasant. Leo dubbed him Rascal and he certainly lived up to his name by promptly climbing the curtains and scratching the furniture. I hate to admit this, but we soon had him declawed, which I will never do such an inhumane thing to a pet again! 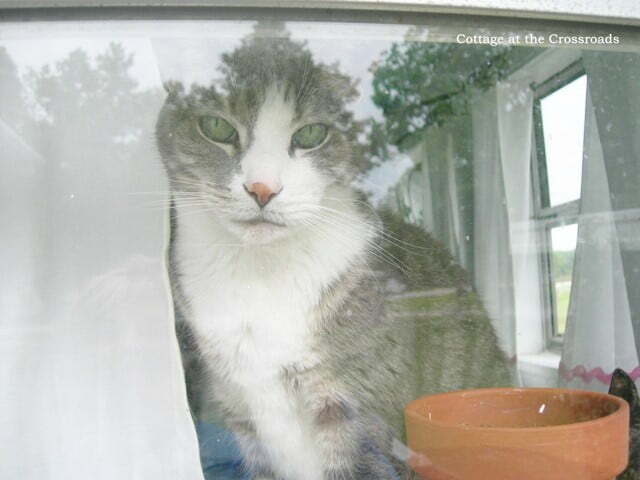 Rascal loved to spend most of his time on our large, screened in porch that we had on the back of our home. He also loved to be held, and I can even remember my friend Susan loaning me an arm sling (she is a nurse and had access to them) and I would carry young Rascal around in the sling as I tried to work around the house. Eventually he outgrew the sling, but for years we always had this game at bedtime. As my feet would leave the floor to get into bed, he would grab my ankles and try to nibble on them. To say that he had personality is an understatement! Rascal transitioned very well when we moved to the Crossroads over 6 years ago. He was content to live out his life as an indoor kitty, never trying to escape out the door. We put up a ledge underneath this window on the back porch just so he would have a perch to watch the world go by and to catch the morning rays of sunshine. We even had the front porch screened in mainly for the pleasure of our cats. 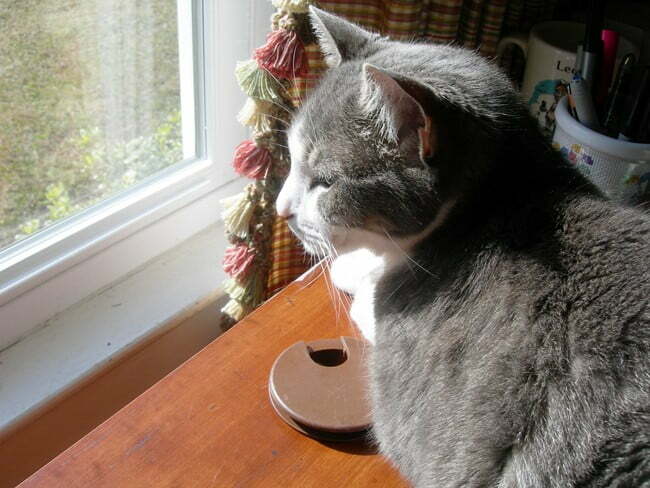 Rascal liked to move around the house during the day following the sunshine. I could always find him in front of a sunny window. We’ve both spent many hours in this chair where I usually sit when I’m working on the computer. Often Rascal could be found perched on the back of the chair while I was sitting in it. But as soon as the computer left my lap, he was ready to jump down and take its place. 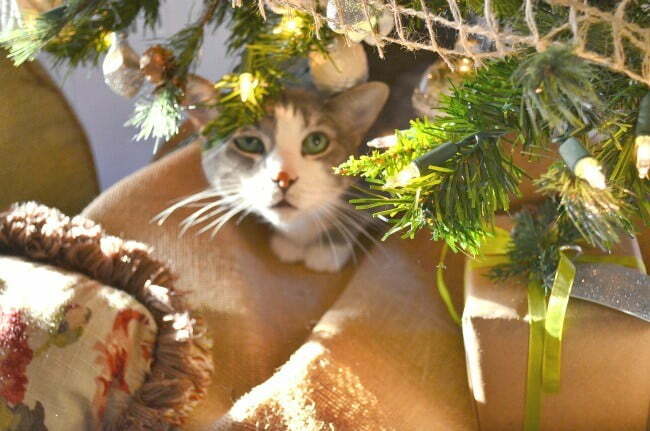 Rascal always loved Christmas! The first year we had him he climbed all the way to the top of the tree, and I would often find him sitting among the branches. When he was older, he was content to just get under the tree. This is one of my favorite photos of him because he has the look of wonderment on his face just like you would see on a child. Rascal was my kitchen companion! Our kitchen is away from the living area so he would hangout on the stool in there with me while I cooked. It has been SO hard to be in that kitchen these past few weeks without him. This past November, I had started noticing a few changes in Rascal, His thirst increased but he was eating well. I knew he was getting old and seemed to be craving warmth so I bought him a heating pad to sleep upon, which he loved. I had told myself that I was going to take him to the vet to get checked out in January. But on New Year’s Eve, he stopped eating, and I knew he was very sick. So I spent New Year’s weekend holding him on my lap until we could get him to the vet on Monday morning. But the news was bad. 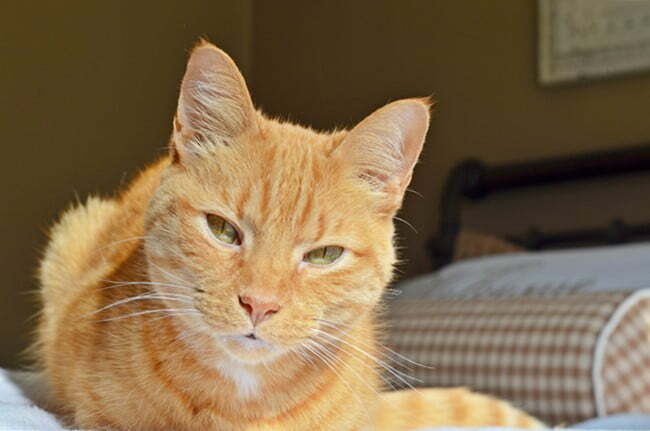 He was in renal failure and our vet helped us make the decision to put him down. I had somewhat expected this but it was so hard to be hit with the reality! Leo and I were emotional wrecks for the rest of the day. It is only now, with the passing of a little time, that I can write about this, but not without tears. Pulling these photos together and writing this post, though, have been cathartic for me. So thanks for being part of my healing process. Henry, who is almost 15 years old, is grieving as well. I can just tell because he walks around the house looking for Rascal. One of the sweetest things that Lucy did was to bring one of her new toys over to my lap when I was holding Rascal over the long New Year’s weekend. She was offering her toy to Rascal, not me. She definitely knew that Rascal was sick. And our cat Juicy, who is an outdoor cat most of the time unless it’s cold, has been spending a lot of time warming my lap lately. Oh, gosh! Pets certainly do enrich our lives but dealing with their loss is so hard! I take comfort in knowing that Rascal is not in any more pain and that perhaps I’ll see him again one day. Thank you for listening, for understanding, and being my friend. Jane, I just saw this and I am so very sorry for your loss. Rascal was beautiful and I could see his personality coming through in his pictures. I have a 17 year old maltese, Casey, so I know that there will be a day that I have to face this too and I am so dreading it. You and Leo will be in my prayers. Thanks for such a touching, beautiful post. Hugs! 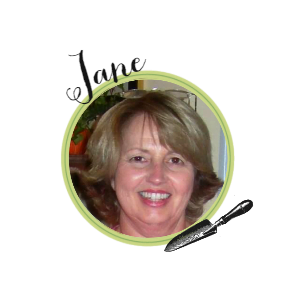 Jane, I am so sorry for the loss of your sweet pet. We lost our cat, Muffin, last year. She was born here on our farm and she died here. She was 15. In the last year or so of her life, I bought her meat baby food to help her maintain her weight. I still miss her terribly. Isn’t it something how the majority of these posts share personal losses of our babies. Like you, I wonder if they may be a part of Heaven. God bless you. I pray you are able to focus on all the pleasure you two had together. Aw Jane and Leo Im so sorry for your fur baby loss. I know how hard it is to let them go and make the decision to do so. I will pray for healing to come to you both. You have such wonderful memories focus on those right now to help get you through. Oh Jane…I cannot even imagine. Our little dog, Kelly, is the first pet I have ever had in my whole life so I have not gone through the pain of losing one. My heart is broken for you though. You and Leo gave Rascal the best life ever. He was one lucky cat! I’m so sorry and I know how hard it is. I’ve gone through it so many times and it never gets easier. I believe our fur babies are waiting for us at the rainbow bridge so we will all be together again one day. Cherish the memories you had with your handsome boy. Hugs to you. Rest in peace, Rascal. This was a beautiful post. 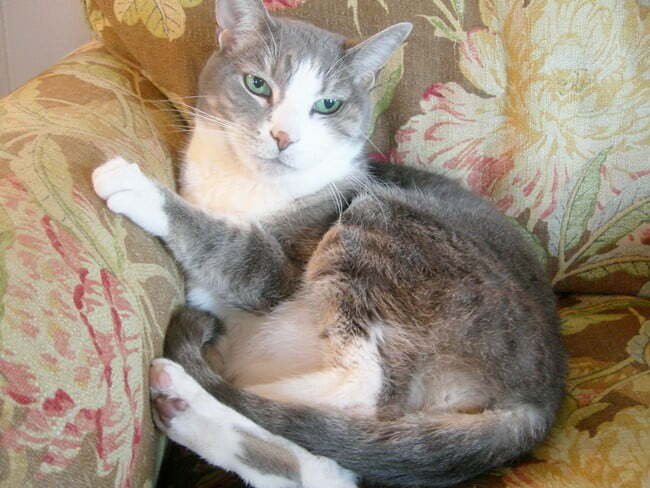 Rascal was quite a special part of your family. So sorry for your loss. Hi – I know the feeling when one has to make that final decision. . It is so hard, but the feeling that you saved Rascal from feeling pain and that is important.. Love all the rest of your fur babies they are all so cute. I am so sorry about your Rascal. The only bad thing my pets have done is die before I was ready. They should live as long as we do so our hearts won’t break. I truly believe the best way to honor a pet we lost is to share the love with another pet who is homeless. One of our dogs is going in for surgery next week and I have been praying and praying that they won’t find anything bad. You are right about the de-clawing, it is terrible. One of our cats ruined the silk chairs in our living room but I don’t care, I love her more than the chairs. He had a long wonderful life. It’s so hard to say goodbye. Animals give unconditional love. He is at peace now. 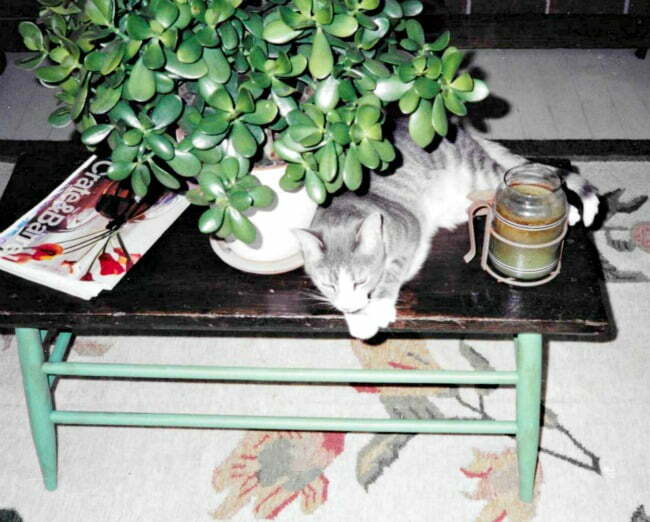 Hold your memories of Rascal close to your heart. Iam so very sorry for you loss, my heart goes out to you. Yes I know what it’s like to lose such a Special part of the Family. We lost our beloved Dog a couple of years ago. He was almost 19 and I still miss him. I now have two Golden Retrievers . One my husband claimed and me the other one. I love them very much and yes they are very spoiled. Take care of each other and your pets. They are so cute. Praying for you and your husband . Sincere condolences. Such a sad time when we loose a family member. I have two kitties and couldn’t bear the thought of loosing them. You will grieve but also you will have cherished memories. So glad you shared your story and allowed all of us the opportunity to read about your journey. 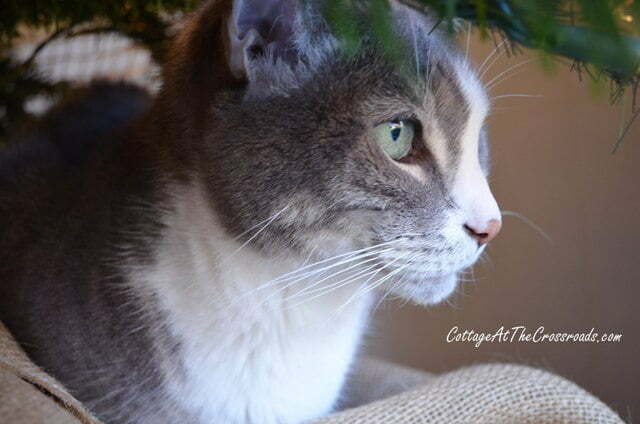 I believe our pets spirit stays with us as a reminder of the joy they brought. So sorry for your loss. Thank you for sharing your pictures and memories. Wonderful pictures and I can tell that he was a wonderful pet. I’ve been there more times than I want to think about…brings tears even now. I do believe (hope) that we will see them again. It takes more time and it will get better. Love on the ones that you have now. 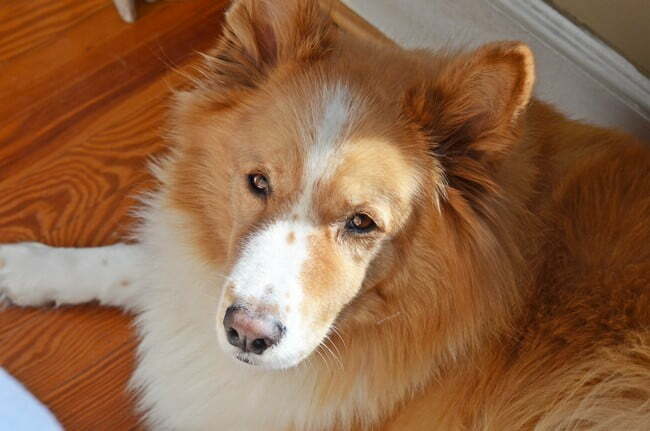 So sorry to hear that your Rascal is gone, he was a handsome boy for sure. I have come to realize that the sadness and tears are the price for all the love and joy our pets bring to our lives. And it is worth it, can’t imagine an empty life without one or more. When one leaves it is their legacy to give a home to another. 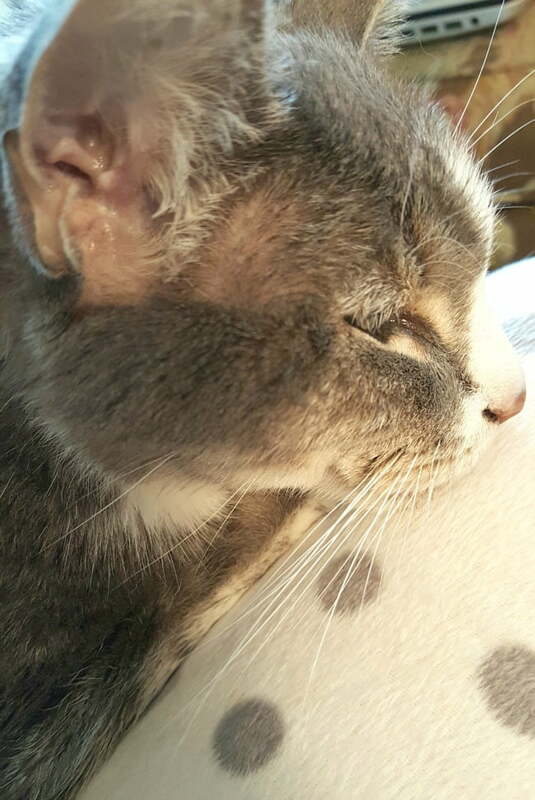 I also had a cat with renal failure and just a FYI to everyone….if caught early it can be managed and the cat have quality of life and a longer life but it takes commitment and work. My girl lived about 10 years with management. The dough bowl will eventually be a sweet reminder of your boy and his cradle. He was loved and felt it and had a good life. Hugs. I’m so sorry for the loss of your sweet kitty. We had to put our sweet greyhound Lady down in April. She had cancer in her leg and could hardly walk. She lasted about 2 weeks after we found out about the cancer. It’s a terrible loss. It helps to know how happy we made them while they lived with us. Praying for you. So sorry to here about your baby. It is so hard to watch them pass on but at least he isn’t in pain any more. My heart goes out to you. Jane, I know first hand the pain you’re feeling! The day after Christmas I needed to put my sweet girl down. 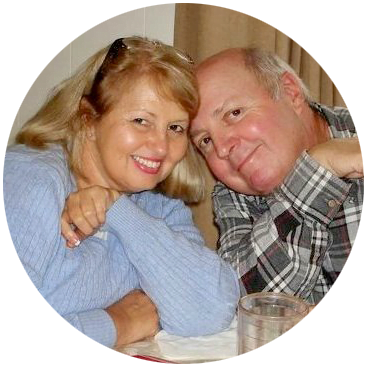 She was diagnosed with sq.uamous cell cancer a few months earlier. She could no longer eat or drink. I t was heartbreaking to see her suffer. The pain and loss I feel is unbelievable. I still see her sitting o n the back of the sofa in the sunshine. My lap was her haven and I’m heartbroken. 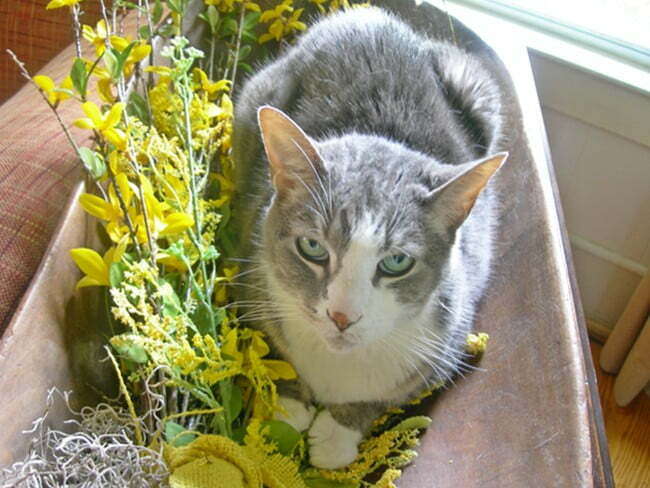 What a lovely tribute to Rascal.I loved hearing about him and seeing him in his favorite sunny spots. How lucky he was to be your ‘fur baby’. I’m so sorry for your loss. We’ve loved and lost several pets over the years and the loss is never easy. Hugs to you and Leo. So sorry for your loss. When we had to put our Golden Retriever down, after 14 years, I went to bed and cried for 2 days. It was such a terrible loss, after losing our son 6 months earlier. God gives us our furry family members for a reason. I can tell you that life gets better, but they are always a part of our hearts. Praying that you will feel better soon. Your post brought tears to my eyes. 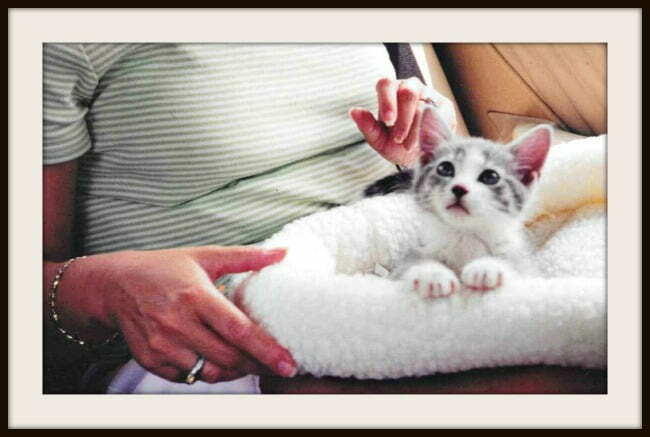 We lost a kitty several years ago to renal failure. I still grieve for her and all our lost fur babies. We now have a sweet, mischievous boy named Buster. I adopted him from Petco 6 years ago. He brings us joy. My heart goes out to you and Leo. It does take time to get used to them being gone. Time will ease your sorrow but he’ll always hold that special place in your heart. I have a 14 year old cat that is showing signs of decline. She’s technically my daughters but she’s always lived here. They sure know how to pull on the heart strings. Take care Jane. We lost our beloved siamese 14 yrs. ago next month and miss him still. He had kidney failure also. He was almost 19 and was raised with our kids. Sorry for your loss, I know how hard it is. We have 2 kitties now that we rescued. They bring so much joy for us every day, don’t they?? Know the feeling, j lost my cat about 3 years ago. I still cry over him. Jane, this is a pain in the heart only pet lovers know. We have it at our house also. We had our two girls, Buttons and Bows, for 14 years. Bows got sick in November and passed over the bridge. Her sister, Buttons missed her terribly and really did grieve for her. She started failing and was ready to give up. She left us two weeks ago. They were the cutest babies when we got them and through the years had given us so much joy and love. We miss them so. We have another kitty, Pearl, who is trying her best to make us feel better. She was dumped off at our house almost three years ago. Something that happens all too often when you live in the country. Some people just don’t get it. Our pets are part of our family. So sorry .. losing our fur babies is so very hard…. My little Schnauzer Gracie, passed away almost 2 years ago… we had her from the time she was 6 weeks old… until she passed at age 16 … I still miss her and yes … every now and then when I see something that reminds me of her… I do still tear up!! They bring such joy and laughter!! How can you not miss them….. Thank you for sharing your pictures…. Blessings!! They are such a part of our lives, she would also sit in the kitchen every night and watch me cook. She had such a way about her – she was almost human. I still miss her so very much, and I have no other animals to keep me company. I hope we will get another cat, but my husband want her to be our last one. I think he thinks its not right to get another cat, because he loved her so much. I hope this day brings you much love from your other little fur babies. Jane…I think most of us know your pain and are sorry that your having to experience this.I have a 14 year old lab who has been such a blessing to me and I dread the day when I will no longer have her. I know my girl is ALWAYS there to welcome me no matter how bad the day may have been, she is always there with her tail wagging! Pets are Gods gifts…they give us unconditional love… they never let us down. Rascal is certainly in heaven. .. just waiting for you! I am so so sorry for your loss. Rascal obviously was such a wonderful companion to you. I cannot begin to imagine how you feel. Please know you and Rascal are both in my prayers. So sorry for your loss. We had to let our dog Casper go this past June. He was 17. It is so hard. `Our pets are such an important parts of our lifes. Your fellow pets lovers feel your pain. God bless you with His healing love. I am so sorry for your loss. I have a home with 4 senior cats and a 17 year old dog. In the past couple of years we have lost 4 beloved fur friends. It is hard every time and the other pets do understand the situation. And then comes the stage when you “think” you see the kitty out of the corner of your eye, going around a corner or on the back of a chair. 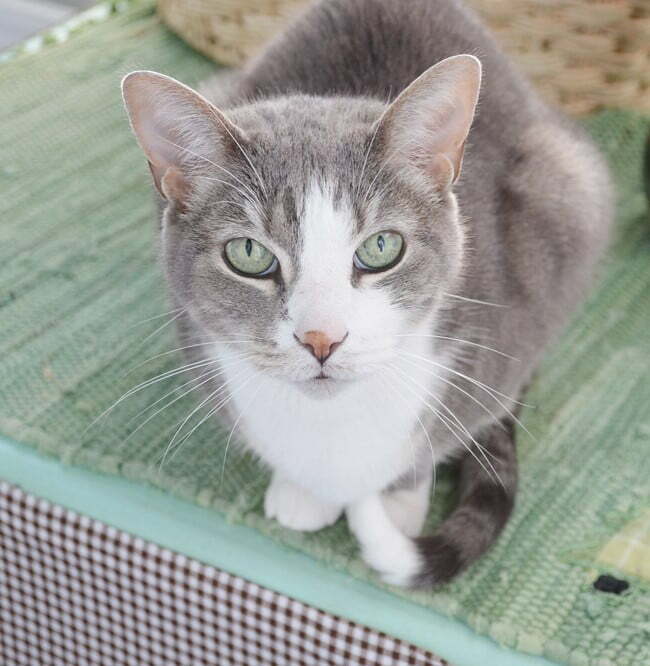 You gave Rascal a wonderful, loving home and he had such a great life! Well done – he loved you just as much as you loved him! My eyes are tearing and my heart is heavy~I know how you feel. I still cry over our sweet Pete. I’m not sure how old he was, he was a grown dog when we got him from the shelter. He was the only dog not barking his head off, but came up to the screen and poked his nose through wanting a nose pat. We took him for a test walk. He didn’t try to pull us along, but wagged his tail and stayed right with us. I knew he would be good with our little boys and I was right. He became a member of the family and it hurt so much when we had to have him put to sleep. The vet came out to our car and both my husband and I held him as he passed away. We were both crying like babies. Our sons were both teenagers and they cried too. Now we remember him so many years later (both sons in their 30’s)and tell about his little pranks and how our cat would love him up one minute and swipe at him the next. He would roll his eyes, knowing how fickle she was. My youngest still holds a grudge about his piece of cornbread Pete stole when he left the room and the innocent look on Pete’s face as he licked his cornbread-crumb laden lips! We all laugh and remember our Pete and miss him like crazy~he was the best! Rest easy Pete, chase all the birds you want at Rainbow Ridge. And say ‘hi’ to Rascal, will ya? I can relate too! We have lost several dogs and one cat over the years. We have pictures of all of them in my husband’s den. Looking at them every time I dust in there, brings back wonderful memories. I take comfort in knowing that they all passed over the rainbow bridge,and one day we will be with them again. Cherishing the wonderful memories if Rascal will give you comfort too. Sorry for your loss! We have a Little Rascal so will think of you often. What a thoughtful and heart-felt tribute to Rascal! It was wonderful that you could give love to each other for so many years. Such a touching memorial for a well-loved family member. I too was surprised by the depth of sadness I felt this past summer when we had to make the decision to put down our 16 year old German shorthaired pointer who was unquestionably the sweetest dog ever. This was followed shortly by having to make the same decision for our ten year old rescue kitty. I especially feel these losses because at our age, I feel it would be unfair to get another pet because I would worry that it might outlive us and end up in shelter or the pound. Our last dog, Enzo, doesn’t seem to mind carrying on for Max and Kitty, and being triple spoiled, but I still miss them sorely. I am so sorry to hear about your cat. I truly understand the sadness that comes when we one of our furry members have our family goes. I have 2 cats who are now 13+ years young and my two beloved dogs, Miata, Cardigan Corgi will be 14 years young next Month. She continues to amaze me with the energy she has every day. I have a sheltie, named Monet and is only 3. She looks up to his bi sister Miata. Miata is quite active for her age and being overweight, but I know she will not be here as long as Monet. I do believe dogs grieve when they lose their “sibling” I will never forget the sadness and perhaps depression Miata experienced when my, doberman, Mercedes dies at 13. It was one very dark day for my family. Blessing to all of our furry kids. My heart is with you as I have been through this too. Your pictures and memories of Rascal are wonderful and hopefully will help the healing and loss. Your other kitties and dog are precious! Thank you for sharing your wonderful memories. I’m so sorry for your loss. My heart is with you as I have gone through this too. I love all the pictures and memories you have of Rascal. Your other kitties and dog are precious!